Under the guidance of the one-and-only Diane Adams, Fanoos Persian Cuisine and Events in Sandy Springs is offering lots of entertainment options for those of us who enjoy world dance and music! Located at 6125 Roswell Road, Fanoos is a great place to get some delicious Persian food, tea, and comfortable seating while enjoying music and dance. For starters, there's belly dancing by a variety of talented local performers every Friday and Saturday from 8:00 to 11:00. But you can also enjoy flamenco by several local troupes. 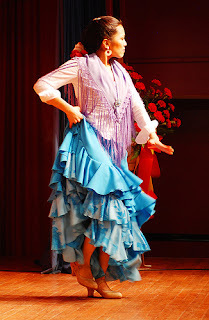 Dancers from Calo Gitano Flamenco Academy perform on the first Sunday of every month. And beginning on October 7th, enjoy Aire Flamenco on the third Wednesday of every month. Aire Flamenco is accompanied by Jean Pierre Verbist; if you attended either of the shows during the Suhaila workshops a few weeks ago, you heard him play some amazing guitar with drummer Danny Stern! Fanoos also offers live music. On Thursday, October 6th, jazz pianist William Green performs. And on Sunday, October 9th, enjoy Latin music with Ecuador's Willie Ziavino. Amoora Dance & Fitness Grand Opening Tonight! Local Troupes Performing Outdoors This Weekend! Suhaila is Coming, Ready or Not! An Embarrassment of Riches this Weekend!